Not many people talk about backing, but when you think about it, the backing you put on a reel can not only affect your fishing, it also has a major influence on the performance of the reel itself. 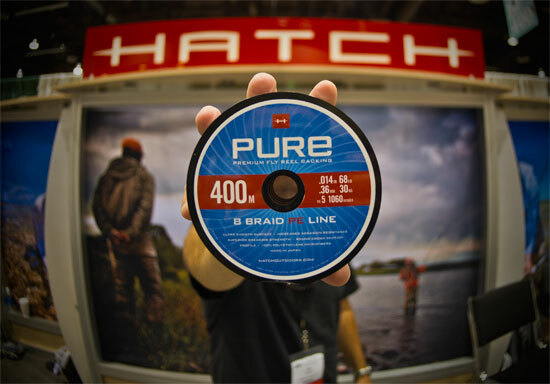 Hatch Outdoors is launching an 8-braid polyethelene line called “Pure” that is .014 inches in diameter, yet the equivalent of 68-pound test. What does that really mean? It feels like Dacron, but it’s strong like gel-spun. One size works on all reels, from trout to tarpon sizes. The company says it won’t lock on itself and won’t cut up the guides on a rod (or your fingers… at least not more than most backing materials). Sounds like a small detail, but I think this is one of the important new intros at the show, as it will no doubt become a standard.